Placements lowest for September since data series began in 1996. The U.S. Department of Agriculture's National Agricultural Statistics Service released the latest “Cattle on Feed” report Oct. 21. The largest surprise of the report was lower placements than anticipated. 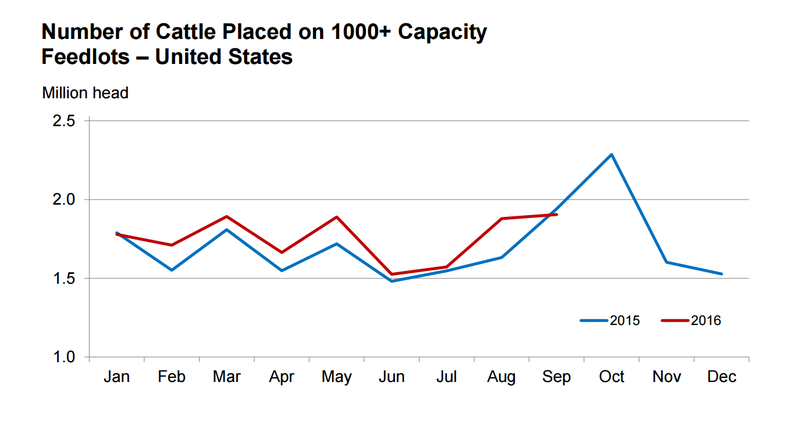 Cattle and calves on feed for the slaughter market in the U.S. for feedlots with a capacity of 1,000 head or more totaled 10.3 million head on Oct. 1, 2016. 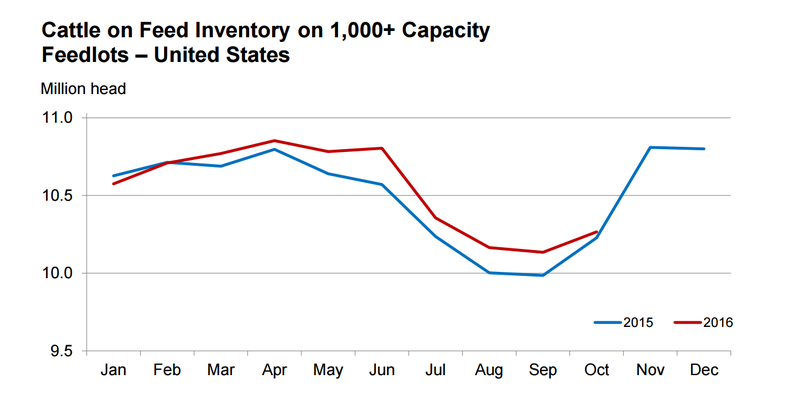 The inventory was slightly above the Oct. 1, 2015, level and near analysts’ pre-report estimates. It included 6.83 million steers and steer calves, down 2% from the previous year. This group accounted for 67% of the total inventory. Heifers and heifer calves accounted for 3.44 million head, up 4% from 2015. Placements in feedlots during September totaled 1.91 million head, 2% below 2015 and the lowest number for September since the series began in 1996. The trade had expected a 3.3% increase. Net placements were 1.86 million head. During September, placements totaled 345,000 head of cattle and calves weighing less than 600 lb., 300,000 head for those weighing 600-699 lb., 455,000 head for those weighing 700-799 lb. and 805,000 head for those weighing 800 lb. and greater. Marketings of fed cattle during September totaled 1.73 million head, 5% above 2015 but 1.3% below pre-report estimates. Other disappearance totaled 42,000 head during September, 26% below 2015. The U.S. imported 98,209 head of cattle in August, 18% below the same period last year, according to USDA’s October “Livestock, Dairy & Poultry Outlook.” Although live cattle imports from Canada were up about 1% in August, shipments from Mexico were almost 33% lower. Imports began to decline around May, at the same time that U.S. feeder cattle prices began to decline. USDA said declining U.S. feeder cattle prices and fairly good pasture conditions in Mexico are expected to continue to weigh on imports. Live imports in 2016 are forecasted at 1.75 million head, down 12% from last year.